How are you all? Enjoying the summer? We have many forest fires here in BC and I have heard on the news there are forest and brush fires happening every where around the world. Please everyone, keep safe! We are still in the midst of a heat wave, I am hoping we get back to normal temps soon! It's too hot for me to be outside, so I too have been playing with my stamps and dies. What have you all been doing with your spare time? 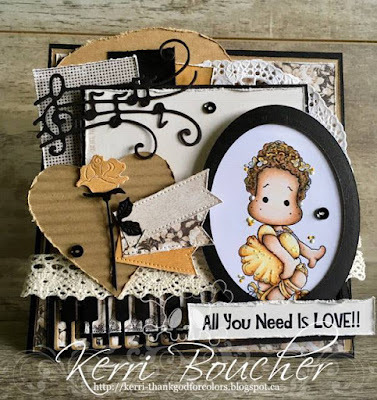 Today Kerri is here to share her beautiful card with us! As I always say, I love her colouring so much!! Kerri started off with stamping the Danish Royal Opera Tilda on Neenah Cardstock, then coloured her in with Prismacolor Premeire Pencils. She has used the Maja Celebration Paper Pad on her card as well. And of course, she used the new DooHickey Kit #19. (I just adore this kit, it's the first one I have bought!!) Also used is Homemade Lace from Poland in Ecru. Any other items used are from her personal stash! 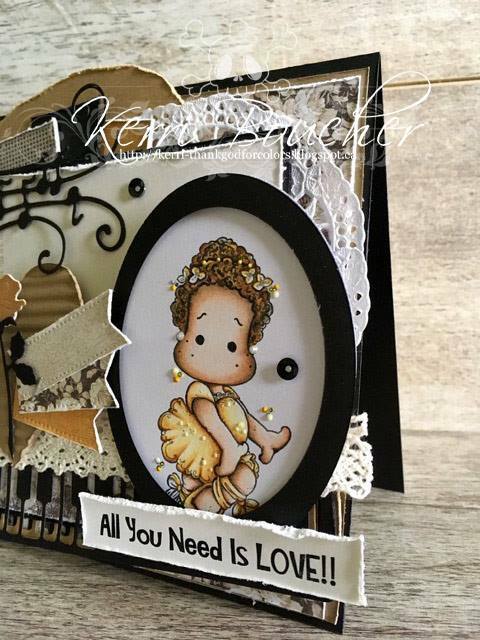 This card is put together brilliantly Kerri, thank you so much for sharing with us! You will find the products Kerri used from the store below. Just click on the wording beneath each picture to be taken directly to that product. Just a quick reminder that this Months Challenge is still going! The link is at the top of this post. You could win $20.00 to spend in the Magnolia-licious store and the opportunity to be our Guest Designer the following month!